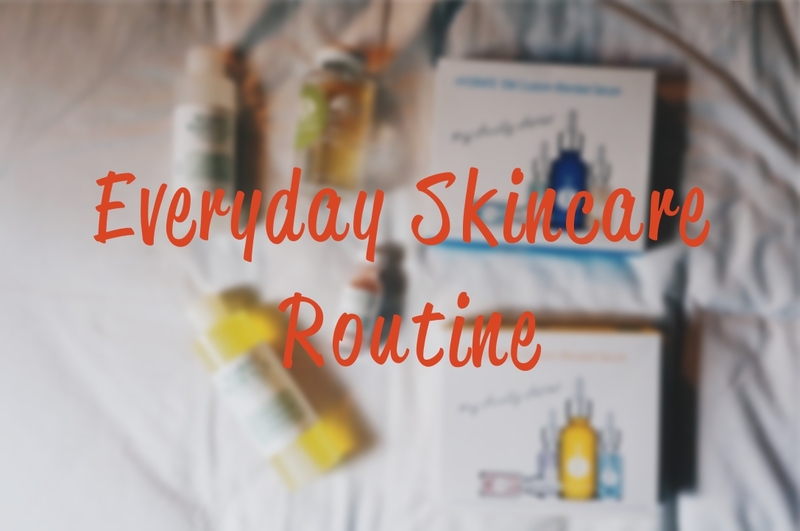 Someone asked me to put up my skincare routine so I was wondering why not? And since Eid is coming, I hope you will learn a thing or two from this post to prep your skin for the big day! Believe it or not, when I reached my puberty, I was battling with acne. Although it wasn't as bad as leaving scars on my cheeks, it did ruin my self-esteem sometimes. I still do have acne once in a while, especially a week before my period. It doesn't bother me as much now because I believe my skin needs to detox once in a while and acne is one of the ways to remove impurities. To keep the acnes at bay, I use Mario Badescu Acne Facial Cleanser. I've been using this for about 2 years now and it works really well. It doesn't dry up my skin too. My face feels clean after every wash but not tight. Next, to prep my skin for the serum, I use Mario Badescu Special Cucumber Lotion. I use this with a cotton pad. My real skin concern now is huge, opened pores and yes, I am starting to see fine lines as well. 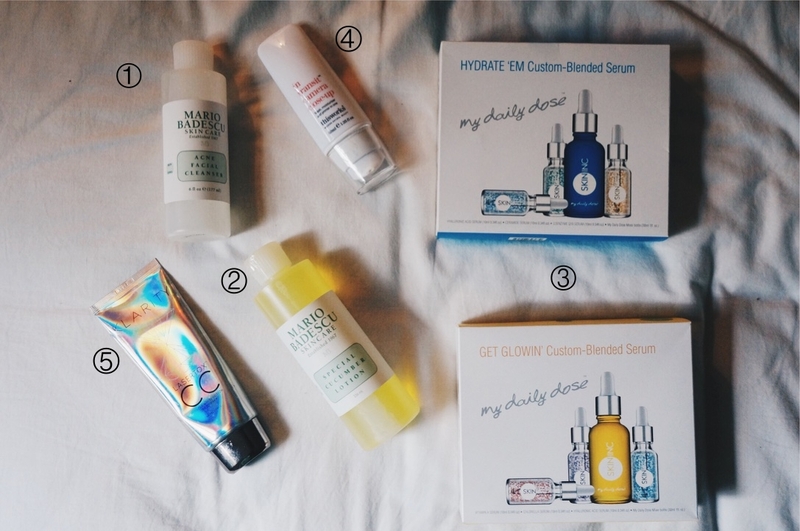 So serums are a big part of my skincare routine now. I juggle between 2 pre-mixed serums by Skin Inc - Custom-Blended Hydrate 'Em and Custom-Blended Get Glowin'. I use them on alternate months and I could see a big difference to my skin. It's smoother now and the pores have shrunk significantly! Both are moisturising and my skin is now dewy. To prep my skin for makeup, I use This Works In Transit Camera Close-Up and Klarity Lasertox Miracle White CC Lotion. This helps to brighten my skin and make my makeup stay longer throughout the day. I remove my makeup with Origins Clean Energy Gentle Cleansing Oil. After spreading it all over my face, I use a hot towel to remove all the makeup. Once done, I use the same Mario Badescu Acne Facial Cleanser. This time I will massage my face longer to make sure all impurities removed. And since I will still be unsatisfied, I use Mario Badescu Special Cucumber Lotion to ensure all makeup is removed. 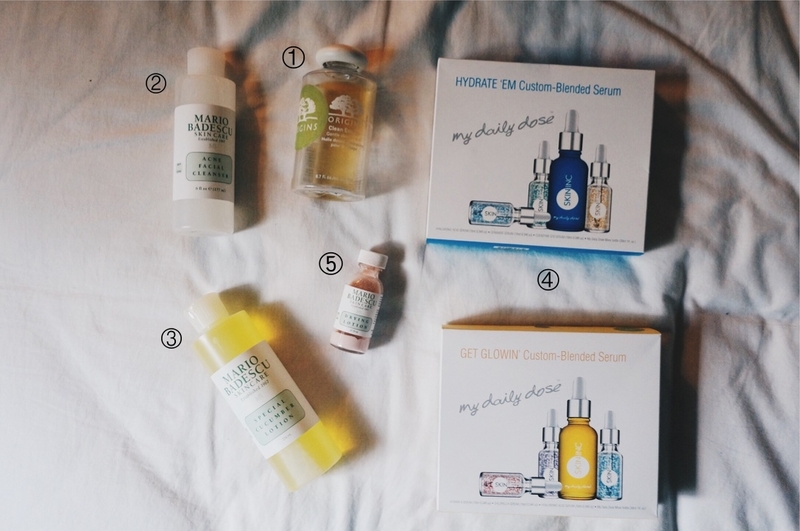 Next, I will use the same serums. After serum, I will need to moisturise my skin. So I'll use Olay Aqua Action Long Lasting Hydration Gel. This smells delicious and it is super moisturising! It can take a while to dry up so it's not an ideal morning moisturiser because I am usually in a rush. If I get a some acne, this is my lifesaver: Mario Badescu Drying Lotion. Even the toughest spots will be gone in a few days! For exfoliation, I use Lush Love Lettuce. This mask helps to remove the whiteheads or blackheads. 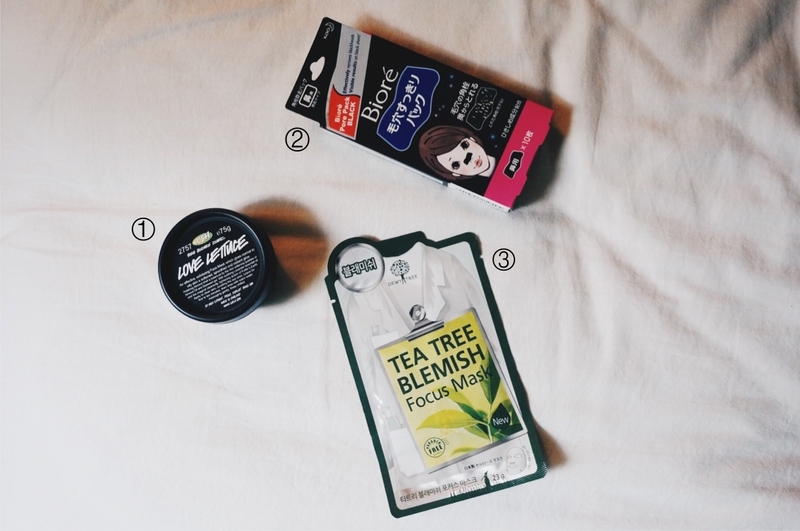 Once I'm done with the mask, I'll use Biore Pore Pack Black which you can get from Watson's. I also use Dewytree's Tea Tree Trouble Solution Mask. I usually buy them in bulk which can be found at BHG. So these are all the products I use! I hope you will find some that you like. I know Eid is coming this Friday. So it's time for you to prep your skin for it. 1 comment on "Everyday Skincare Routine"
salam! may i ask is the Lush Love Lettuce is effective for removing white heads?